Inspired Life: Are You an Over-Apologizer? How often do you say you’re sorry? Not because you really owe someone an apology, but because you take responsibility for everything – even things that are not your fault. We sometimes thing of people who do this as super nice. But have you ever wondered what is really behind it? I live in the Midwest, where people are notorious for apologizing. It's called a Midwest apology, something also connected with "Midwest nice." Not that we're really nicer than other people. Maybe were just less honest about our real feelings! It isn't unusual at all for someone to bump into me at Target when we're both trying to squeeze through to the best bargain rack, but then I respond with, "Ope. Sorry." I have accidentally cut someone off in traffic, but then I try to exaggerate a mouthed "SORRY," as I wave my hand. Their honk makes me feel even worse. But my gesture isn't always received as an apology. Sometimes, it's misinterpreted as another gesture in their limited vision of my apologetic intent through the glare on my windshield. Here are some of the expressions you may have caught yourself using. Please excuse the mess. I haven't cleaned. Sorry, is this the way to the conference room? Oh, this old thing? It’s such a ratty shirt. Perhaps you also apologize when you set boundaries and say no. I'm sorry, I can't help you out with that. Or the apology that projects false hope: I'm sorry, I can't help you out with that, right now. I can't afford to come to you kitchen gadget party. Sorry! Or how about when you are asked for your opinion and you don't love the thing about which you are asked. Do you apologize for feeling a certain way? I'm sorry. I don't love it. It's not my favorite. Sorry. What if you just simply acknowledge someone else's feelings without apologizing for your own? Example: "I don't love it. I know it's discouraging for you to hear that." Apologizing or “sorry syndrome” can make us likeable to some people. Studies have even shown this. But when does it go too far? Can false humility start to become unhealthy? Are you an apologizer? Have you ever noticed that when you apologize about everything – even things that are not your responsibility – that you start to feel small? Excuse me, can I ask you for advice? I’m a bother to people. I really shouldn’t get in their way. My house is way messier than everyone else’s. Who would want to come over here? I’m taking up too much space in this seat on the airplane. I haven’t lost the 50 pounds that I should have by now, and I’m probably bothering someone this person next to me. I know they were hoping they wouldn't get stuck sitting by me when I got on the plane (as you scrunch your shoulders together to make yourself smaller in the middle seat). Let me tell you the truth about your identity. There is no need to apologize for anything. Of course if you say something completely insensitive and rude that is uncalled for, you should apologize. But, not for the weather. Not for getting a promotion you earned. Do you realize this about your identity? You are loved– You maybe haven’t discovered it yet, but God loves you. When you apologize for who you are, you're questioning his plan. You are not a mistake– God created you with a unique plan and purpose and you don’t find it by digging down somewhere inside and pulling out confidence as you pull yourself up by your bootstraps. You find it when you are secure in your identity in Christ, when you discover your place as his own child and you discover his power that you already had within you. You are not less than– Not less than someone else. Not less than the image of perfection you have created in your mind. Not less than valuable. Stop apologizing and start living in the truth of who God created you to be – imperfections and all. I think what holds us back sometimes is that we carry around a lot of baggage. I will be talking about this more on upcoming episodes and articles, but today let’s just look at what the baggage can do to us. I love old suitcases and trunks. I often use one as an illustration when I'm speaking. I want you to imagine how functional I would be if I had to carry a suitcase everywhere with me. If I had to take it to work, to the store, out for a walk. I take it to the bathroom. In the shower. On a date. Some of you have toddlers. You can relate to carrying something, or someone everywhere with you. Now imagine you have to carry your toddler, your purse, a bag of groceries, AND a suitcase. You have no hands free to do anything. You don’t even know what to put down. 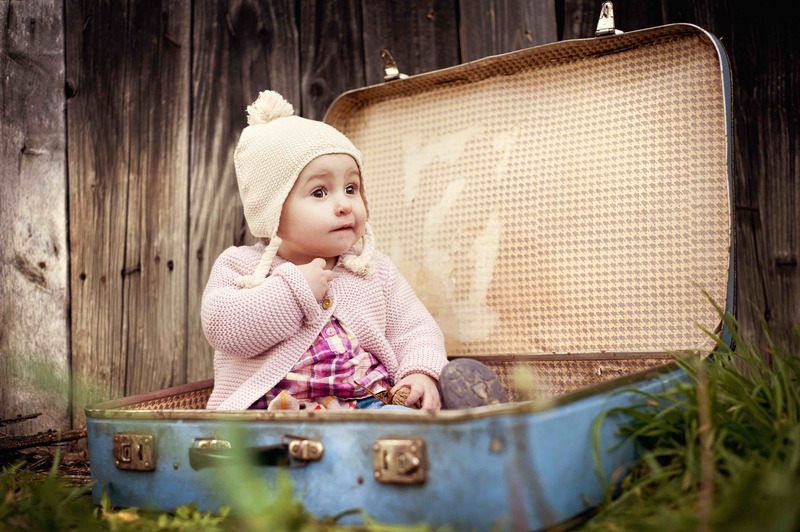 The suitcase represents the emotional baggage you’ve packed away in your mind and deep in your wounded heart. It goes everywhere with you. It dictates your responses to challenges, pain, human relationships. You’re affected by its presence, whether you know it or not. How do the contents of your own baggage cause you to apologize for who you are? Does it hold you back from the best life that you could be living? What a beautiful picture of the wonderfully complex person God created you to be! He didn't make a mistake with you. And that baggage, that wasn't meant to be part of your daily routine. Where has the baggage crowded out your ability to receive love, or compliments, or help from others? Will you take a first step toward releasing that baggage? In our upcoming resources section, I will share one way that you can spend the next 40 days working on releasing some of that. I recommend this devotional as a way of resetting your thinking for 40 days to recognize the power of God at work within you. If you struggle with over-apologizing, this might be a wonderful way to work on changing your focus from lies to truth. The Power to Be contains truths “to help you shift your attention from situations and self to a big God.” Twila talks about how our circumstances don’t change who God is – they show us who he is. I love how each devotion has a power statement that you can declare, and then it has some questions for personal reflection. This would be wonderful for journaling. On page 81, Twila has a devotion about the verse I mentioned above. Twila says, "You are one of God's works, and God's works are wonderful. Do you know that full well? That's where being strong begins. We can't be strong when our concept of who we are is weak." The power statement for that day is: I am strong. I know who I am, and I realize my value comes from God. Are you ready for 40 days of discovery of being still, being grateful, being strong, and being courageous? Does your devotional contain Scripture? One more little tidbit for you. When you look for a devotional, but sure it has Scripture included. I’ve seen books out there that are labeled as devotionals, and have some positive thoughts, but they have no ties to the truth from Scripture. The idea that you can find truth within yourself is a lie. Truth is found in God’s Word. I love that Twila grounds every single devotion in this book in a TON of Scripture. When you send a direct message on Facebook, Twitter, or Instagram, tell me something you’ve noticed from my bio that we have in common. I love to get to know new people through those private chats! Have you reviewed the podcast yet? I’d love if you would leave a review on iTunes or Google plus. Be sure to follow so you can get each episode on your podcasts when it is released. (Please note: books posted here on my blog are purely because I want to share them. Sometimes I receive free copies for review, and other times I purchase the books. Some I get from the library. Either way, any endorsement I offer here on the blog is simply because I want to talk about the book. ) *This post contains affiliate links, meaning, at no additional cost to you, if you click through and make a purchase, I may receive a commission. I sell my ebook via Amazon but I’m also a part of their “Associates” (i.e. affiliate) program which pays a commission on books and any other Amazon products people purchase via my links. Posted in Articles, Everyday Life & Practical Tips, Faith and Inspiration.